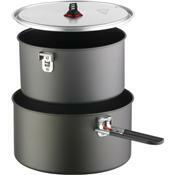 Fire up the stove and get some chow cooking in the MSR Flex 3 Pot Set. When you're cooking for you and a few buddies, this kit's 3.3-liter anodized pot and 2.3-liter DuraLite non-stick pot deliver the goods. The included strainer lid covers both pots, and a Talon pot grabber stays securely attached to your stewing goodness.